Let’s get back on the road again. Roadtrip-'62 ™ is leaving Danbury, Connecticut this morning on our sixth day of travel along historic US-6 with me, Don Milne. As your virtual tourguide, I’ll be guiding you through New York and the year 1962 today. Something I’ve noticed about this trip that is our route from east to west follows the settlement of the United States. We’ve seen a lot of very old sites in the past few days from the Colonial period of the 1600s and the Revolutionary War. We have a few more to see, but then things start getting newer the farther west we go. By the time we get to the Rocky Mountains, there will be some places that were barely settled by 1900! On the way, if you see anything you like, get yourself out on the road and enjoy it in person. This virtual roadtrip may be fun, but there's nothing like the real thing! At any time, click on an underlined word below to learn more about the places on the trip. Time for me to grab the wheel and go! If we lived in Danbury, we could still have milk delivered to our house, just like in 1962! Marcus Dairy is still providing home delivery, though most dairies stopped the service several decades ago. I remember the Borden man coming by daily when growing up. Our driver had a truck that still used real ice to keep the products cold, not a refrigerated truck. He was also nice enough to chip some ice for all the neighborhood kids who gathered around the truck on hot summer days! I’m sure our families bought plenty enough milk products to cover the cost of an extra block of ice once in awhile. In Danbury, Marcus Dairy has been delivering since at least 1924. They claim their milk is the freshest you can buy because it is bottled one day and delivered the next day right to your door. And they may be right: if you’ve ever looked at the dates on the milk in a supermarket you can see it may be on the shelf for a week or more before you buy it! Marcus also had a beautiful dairy bar we could have stopped at last night for ice cream, if it were really 1962. But that store and its associated dairy plant closed in 2011 and has since been demolished, so we’re a bit late. Railroad buffs may want to stop at the Danbury Railway Museum, but we won’t because it’s only been open since 1995. In 1962, the station building which now houses the museum was still an operating passenger and freight station. It gained a bit of fame when Alfred Hitchcock's 1951 movie "Strangers on a Train" was filmed in and near the station. Instead, I’m going to use my time hiking the countryside at nearby Seth Low Pierrepont State Park Reserve. The park is a bit south of US-6, on our way out of town. It was donated to the state in 1956 and is largely undeveloped. There are about 4 miles of trails and I’m hoping the trail near Pierrepont Pond is interesting because that’s where I’m heading. As we cross the New York state line, we would have passed the Dinosaur Gift and Mineral Shoppe. The pink dinosaur was in front of the shop and was a big tourist attraction until I-84 was finished, which greatly reduced traffic on US-6. The freeway was under construction in the 1960-64 period, with my 1963 Gulf Tourguide map showing only the Connecticut portion open. It seems an odd location to me for a school trip, but reader at Marc Catone notes that his 4th grade class made a field trip to the gift shop. Maybe more of us should have made field trips to gift shops like this, as they are mostly a part of our history that we can’t visit now. At Brewster, New York, US-202 separates from US-6, though we meet again in just 21 miles at Peekskill, New York. Also, I-84 heads north but we will meet it again in Middletown, New York. Even though the interstate will leave us alone for awhile, we’ll find US-6 on a freeway of its own after we cross the Hudson River. We head down to Mahopac, New York now, where Doug Auld, editor and publisher of Sprint Car & Midget Magazine, was born on June 25, 1962. His magazine is the now world's leading short track open-wheel magazine. That’s a racing sport I never heard of before, but it’s really just another type of auto racing. Sprint cars are high-powered racing cars designed mostly for running on short oval or circular tracks. Many IndyCar Series and NASCAR drivers have used sprint car racing as a step to more high profile divisions, including Indianapolis 500 winners A.J. Foyt, Mario Andretti, and Al Unser Jr., as well as NASCAR Sprint Cup champions Tony Stewart and Jeff Gordon. Many of the cars have ‘wings’ on top, which increase the downforce on the car, making the car easier to control. The wings were first used by Jim Cushman at the Columbus Motor Speedway in Columbus, Ohio in 1958, so we could have seen this sport back in 1962. South of town, US-6 parallels the old New York Central Railroad line, now the Putnam Trailway, a hiking and biking trail. This was an early example of railroad abandonment because of a parallel line. Passenger service ended in 1958 but because the line had no tunnels and good clearances, "high and wide" freight used the tracks until the West Shore line was upgraded for oversize freight traffic in the early 1960s. Beginning in 1962, tracks were removed here, starting with the 23 miles between Lake Mahopac and East View. We travel more or less parallel to the old line to Peekskill, New York. At Peekskill, we meet US-202 again and US-9. Route US-9 spans from Canada to Laurel, Delaware and is the second longest of the single digit US-numbered routes. It is one of only two US highways with a ferry connection, the other is US-10 which we crossed back on our US-23 roadtrip. And just in case you thought we had left our final New England-style traffic rotary behind, you’re wrong. There is one at the west edge of town where we turn onto US-9 for a brief trip south. Let’s travel just a couple of miles south to take a peek at the Indian Point Energy Center in Buchannan, New York. This nuclear plant is the site of the Indian Point Unit 1 reactor, a 275-megawatt pressurized water reactor built by Consolidated Edison that began operations on September 16, 1962. It’s now permanently shut down and replaced by Units 2 and 3. The Unit 1 reactor was shut down in 1974, having run only 12 years, because the emergency core cooling system no longer met regulatory requirements. Unit 2 had started up just the month before to replace it and Unit 3 came online two years later. These two newer reactors now generate up to 30% of the electricity used in New York City. Back in 1962, nuclear power was considered the power of the future. Eight plants began running in 1962; five of them constructed by the Atomic Energy Commission under their demonstration program. That’s a measure of how new the idea of atomic power still was. As a kid, I remember visiting the Big Rock Point power plant in Michigan, which also opened in 1962. It had a visitor center, just like any other tourist attraction! General Electric, which builds turbines and control equipment for nuclear plants, even published a comic book in 1955 touting the wonder and safety of this new way to generate electricity. Over the years though, the rosy glow faded, as plant costs skyrocketed and safety issues received more notice. The future of the Indian Point Energy Center is even uncertain because it is in a more densely populated area than any of the other 66 nuclear plant sites in the country. It has at times been on the Federal list of the nation's worst nuclear power plants and in February 2000, it was shut down for 11 months due to a small radioactive leak from a steam tube. The plant’s certificates of operation are set to expire in 2013 and 2015, unless renewed. Located just 5 miles north of US-6 in Garrison, New York is the elegant Boscobel House and Gardens. Boscobel is a Federal-period house with one of the nation's leading collections of furniture and decorative arts from the Federal period. The furniture includes pieces by the best of the early nineteenth century furniture makers such as Duncan Phyfe. Though Westchester County Parks acquired the property in 1923, the house was not restored. In fact, it remained vacant and largely unmaintained until 1955. At that time, the property had been purchased for a Veterans Hospital and the federal government awarded a demolition contract. Only quick local action with significant financial backing by Mrs. Lila Acheson Wallace, co-founder of the Reader’s Digest, finally saved the house. The house was moved to another site and on May 21, 1961, the restored home of States and Elizabeth Dyckman opened to the public. We could have seen it in all its reconstructed and redecorated splendor in 1962! Back down the Hudson River we go to US-6 and then back into Peekskill, New York, where it’s time for lunch. 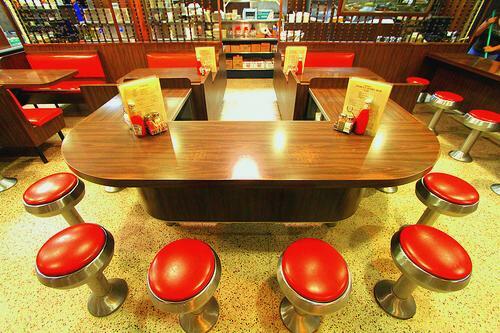 Being in the northeast, there are diners everywhere! A couple to choose from are the Center Diner, in operation here since 1937 in what appears to be an old steel coach car. Besides usual diner fare, they feature some Greek food. Another choice is the Westchester Diner, serving seafood in addition to a classic diner menu. They make their own desserts, including a pumpkin cheesecake! Maybe I’ll just flip a coin and see which diner wins. A landmark in Peekskill is the Paramount Center for the Arts. This 1500-seat movie palace opened in 1930; one of a chain of Paramount theaters around the country. It was designed by the architectural firm of George and Charles Rapp, who designed great theatres all across America. Paramount Pictures had originally planned to build one "perfect movie house" in every state of the union. But only a few were completed before the Great Depression ended this plan. In addition to this one, there are Paramounts in Oakland, California; Denver, Colorado; Aurora, Illinois; Anderson, Indiana; Cedar Rapids, Iowa; Springfield, Massachusetts; Bristol, Tennessee; Abilene, Texas; Austin, Texas; Charlottesville, Virginia; and Seattle, Washington. There is also one that we drove past on our US-23 roadtrip, in Ashland, Kentucky! The one here in Peekskil had a great Wurlitzer theatre organ, which rose from the pit. If you’ve never seen this, or heard a Wurlitzer played, you really should stop in for the show. In 1962, this Paramount was still showing movies but the building was acquired by the City of Peekskill in 1977 due to a tax default. In 1982, following renovations and improvements including repairing and replastering the walls and ceiling and recreating the original 1930s ceiling design on hand-painted canvases and installing them on the ceiling, the Paramount Center for the Performing Arts opened. The Center is currently operated by a local non-profit corporation. You can see movies, plays, Chinese acrobats, and every genre of music imaginable. Unfortunately, just as with the Paramount in Ashland, Kentucky, we’re too early in the day to see any performance. We cross the Hudson River together wish US-202 on the historic Bear Mountain Bridge. When this bridge was completed in 1924, it held the record for the longest suspension bridge in the world for 19 months. It is also historic because it was the first suspension bridge to have a concrete deck. It was built by a private firm, after the New York legislature authorized creation of the Bear Mountain Hudson River Bridge Company. The purpose was to complete the bridge and a three mile road from Peekskill. The 11-member board of directors included financier E. Roland Harriman, whose brokerage firm helped sell the bond issue that funded the company. Under this 1922 charter, ownership of the bridge was to revert by 1962 from the bridge company to New York State. However, the state also retained the right to acquire the bridge at any time, and did so in 1940, so this was a public bridge by the time we arrived. It became the oldest of the New York State Bridge Authority’s bridges, and was actually the first vehicular river crossing between New York City and Albany. One unique feature of the bridge is the pedestrian walkways on both sides of the bridge. This allows the Appalachian National Scenic Trail to cross the Hudson River. From here it heads south through Bear Mountain State Park and eventually the Appalachian Trail crosses US-23 at the Tennessee / North Carolina state line. I got lucky with my choice to travel US-6 westbound, because the toll of $1.25 is collected from eastbound traffic only! Speaking of Bear Mountain State Park, let’s go. The park has lots of hiking but it’s mostly up and down a mountain: not my style even though you get some great views of the Hudson River Valley. If you want a great view without mountain hiking, you can do what I will, drive to the summit on Perkins Memorial Drive. The park opened in 1913, and the drive and viewing tower at the mountain top was completed in 1932-34. The park was originally reached mostly by steamboat from New York City before the roads were constructed. Besides the views, there is a small zoo for rehabilitating animals and a carousel. The park also abuts Harriman State Park on its south boundary. At the west side of the bridge, we drove through our next-to-last of those rotaries, crossing route US-9W. We could follow US-9W north to West Point, New York, where West Point Military Academy, Monument, and Museum is located. This is the oldest continuously occupied military post in America, dating back to the Revolutionary War and 1778. The United States Military Academy was established here by legislation in 1802. But West Point is too far off US-6 for us to see this trip. We’ll check it out if we ever get to a Roadtrip-’62 ™ journey down US-9. Instead, we’ll stay on US-6, which becomes a freeway for the next three miles, on the Palisades Interstate Parkway. This freeway was completed by 1958, so we would have used it. US-6 continues through wooded state park lands with no development for another seven miles and is known as the Long Mountain Parkway. Most of this road was also here before 1962, though the last section bypassing Central Valley, New York wasn’t completed until 1968. The section of the old road to Central Valley, Estrada Road, no longer connects to US-6 so we won’t go that way. From Harriman, New York to Goshen, New York, we’ll also travel a freeway, as this portion of US-6 was constructed in 1954 and 1955. This is known as the Quickway and is signed with route NY-17. Goshen is home to the Harness Racing Museum & Hall of Fame, which opened in 1951. The museum building was built as a stable in 1913. It houses racing memorabilia dating back to the start of trotting, in addition to artwork by famous equine artists. The collection includes more than 1,709 works of fine art; 6,000 pieces of ephemera such as tickets, programs, and scrapbooks; nearly 20,000 photographs; driving jackets, caps and helmets; and even a collection of sulkies and carts. In 1995, following years of neglect at the closed Roosevelt Raceway, one of New York State's finest harness racing venues, the museum acquired the track’s historic records and artifacts when they were offered by the owners. This treasure trove contains photographs, press releases, video tapes, books, movies and other archival materials. In addition to the collections, the Hall of Fame inducts nominees under the categories of Living Persons, Living Horses, and Immortals. The museum reminded me that in 1962, US-6 ran directly by the old "Good Time Park" race track. That mile-long, triangular track was the site, from 1930-1956, of the Hambletonian Stake, harness racing’s richest and most prestigious event. In 1962 the track was still there, but was used only for training. You can still see the location in aerial photos, overgrown and all but forgotten, and with a bite out of the southern part for a freeway frontage road. In case you thought harness racing was dead in the area, you’re in for a treat. Goshen is also home to Goshen Historic Track, the oldest harness track in the United States, established in 1838. This neighboring half-mile oval track is a National Historic Landmark. It’s not only the oldest harness horse track still in use in the United States, but is one of only two sporting sites in America to be designated a Registered Historic Landmark. Goshen Historic Track received this designation from the National Park Service in 1966: the other site, the Kentucky Derby’s Churchill Downs, received a similar designation 22 years later. If you are driving through in June or July, you can see racing in the afternoon, but we’re too late in the day for one of those matinee races. Earlier in 2012, the horse Thirty Two Red won a division of the Landmark Stakes for 2-year-old male pacers by 5-1/2 lengths over Story Book in a track-record 1:56.3 minutes! This was a full second off the previous record, which was shared by Know The Pro and Jagger Blue Chip. And this in the first start of Thirty Two Red’s career! I guess you can always find something exciting at the track, whether you’re here in 1962 or today. It’s getting too late in the day to find much of anything else open, except restaurants. Before we stop for the night, I think I’ll drop in at Homer’s Coffee Shop in Port Jervis, New York. They tout their milkshakes and offer them as malteds, so let’s give them a test. An ice cream treat before dinner! Afterwards, let’s swing by the Erie Lackawanna Depot. This grand example of Victorian architecture still served passenger trains in 1962, but only for 4 more years. As with many such depots, when it closed it sat vacant and deteriorating for many years. By 1984, the Minisink Valley Historical Society became involved in efforts to rescue the building from demolition and by 1992 had significantly restored it and opened it to the public, where it now houses stores and professional offices. Port Jervis maintains a passenger railroad presence today, with the city's Metro-North station being the most remote of New York City’s extensive commuter rail network. Crossing the Delaware River, we meet US-209 and run with it into Milford, Pennsylvania. Route US-209 runs from Pennsylvania to Kingston, New York, partly on a route that long ago was part of US-6. On the Pennsylvania side, US-6 runs right alongside of the I-84 freeway, which cuts through the edge of the hills providing some scenic cliff views from our motel. I found this old motel which is currently branded as a Scottish Inn but originally was a mom-and-pop inn back in 1962. It was constructed around 1946 but I haven’t discovered the original name yet. When I stayed in 2011, it was pleasant and clean, and conveniently located for dinner, next door to the Village Diner. The diner was established in 1956 and was built by the Mountain View Diner Company. Seems like a good idea to open a diner next to a motel, and since it's still open over 50 years later, I guess it was. After dinner, I’m gong to an event at the Milford Theater tonight. This small town theater opened somewhere between 1910-1920 as a silent movie house. Besides movies, during the 1950s and later it hosted summer stock theater. It is now the home of the Milford Music Festival and the Black Bear Film Festival, among other events. The theater was renovated in 2011 after my photo was taken, just in time for the festival, and is a much more pleasant venue today than just a few years back. The Black Bear Film Festival is Northeastern Pennsylvania’s Premier Independent Film event. It is a designated historic site, as are two-thirds of Milford Borough buildings. This is thought to be the highest proportion of any municipality in the country. That’s it for this show. Next time Roadtrip-’62 ™ will continue west through Pennsylvania. We’ll see some more historic sites, scenery, trains, and of course some surprises. We’ll also investigate some more of 1962, with a look at more history, more people, and industrial development. ‘Til next time, have a great roadtrip, we are!